So much for those predictions of a flood of immigrants coming from Romania and Bulgaria once the door to the UK was opened - ie after visa restrictions were removed on 1 January this year. The first set of data since immigration controls were lifted on the newest countries to join the EU - the official Labour Force Survey - show that there were 140,000 people born in those two countries in the British workforce in the first three months of this year. That's 4,000 lower than in the final three months of 2013 when visas were still required. Those who've talked of tens of thousands let alone millions coming here will point to the fact that the numbers are up on a year ago - the figure for the first three months of 2013 was 112,000. Those with no axe to grind will point out that these figures are of course only the first and a partial measure of what's been going on. There may be many people working in the 'grey economy' and who are not registered. We will know more when we see the figures for the whole of this year. In just over a week's time - on election day as it happens - we will get data on the number of National Insurance numbers issued to overseas nationals. In addition, it's worth noting that there has been a continuing large influx from Eurozone crisis countries eg Spain/Greece and other parts of Eastern Europe. Despite the prime minister's confident assertions yesterday the Conservatives know that they are very unlikely to meet their election promise to cut net migration to tens of thousands. Unhelpfully for them we will also get the net migration figures on 22 May - election day - showing how far off course they are. 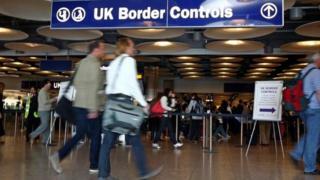 However, today the questions will be for UKIP who warned of a flood of new immigrants from the two countries. CORRECTION: In the fourth paragraph I had said "Those who've talked of tens of thousands let alone millions coming here will point to the fact that the numbers are up on a year ago - the figure for the first three months of 2012 was 112,000." I should have said 2013 and it has been updated.